When all is said and done, the thought of making a smoothie yourself starts to seem less than appealing. Instead, you wind up paying for an overpriced drink somewhere else that contains some sort of mystery ingredients and usually a boat-load of added sugar. Yuck—not healthy! The good news is, SmoothieBox is going to change all of that for you. Their smoothies are pre-portioned, making them easy to whip up in the morning. And the best part is that they’re packed full of real fruits and veggies, as well as grass-fed collagen protein. As a sister company to ButcherBox, it’s safe to say SmoothieBox is well on their way to becoming a name in the food delivery world. So, if you want to check it out for yourself, here are all the details you need to know! Getting started with SmoothieBox really couldn’t be easier. To begin, simply submit your email address and zip code on their website. This allows them to verify that they do, in fact, ship to your location. Unfortunately, they don’t ship everywhere as of publishing this review but they do ship to most of the US (more on that later in the review). After you’ve filled out your info and they’ve verified they can ship to you, you’ll be able to pick your plan and build your box. The first thing you’ll need to decide is how often you want to receive SmoothieBox deliveries. Would you like to receive orders every month or every other month? The benefit of SmoothieBox is that they allow you to increase or decrease your delivery frequency later on, plus you can cancel your subscription anytime you want. The fact that they give you the instant flexibility to change delivery frequency right in your account is a huge perk. Next, it’s time to pick which smoothie flavors you’d like to purchase. You can choose their “Quick Fill” option, which gives you a selection of their most popular flavors. This is what we did for our initial review (as you’ll see in the video). For instance, this will get you one Cacao Pack, one Green Pack, and two Clementine Packs. This gets you a total of 20 smoothies to enjoy. Or you can take full control over your box and add as many of your favorites as you’d like. Once you’ve made your smoothie selection, you’ll be taken to the checkout page. Just fill out all your customer information and billing details. Before you know it, your smoothies will be on their way to your door. At this time, SmoothieBox only has three flavors to offer their customers. Although some might find this is rather limiting, we actually enjoy not having to search through a bunch of different flavors trying to guess which ones we might like (as is the case with some other smoothie delivery services). The three flavors they currently offer include: Cacao, Green, and Clementine. The Cacao smoothie is described as tasting like chocolate pudding with a bit of a crunch. It contains banana, zucchini, kale, coconut water, grass-fed collagen protein, sunflower seeds, banana puree, coconut cream, cacao nibs, cacao powder, and sea salt. This one ended up being my personal favorite! It’s the perfect breakfast smoothie or post-workout shake (due to the high protein). If you’re someone who loves to get in those green veggies, you’ll appreciate their Green Super Smoothie. This one is packed with chopped spinach, avocado, pineapple, grass-fed collagen protein, lemon juice, pineapple juice, water, ginger, dates, flax seed, and sea salt. Finally, there’s the Clementine smoothie. It contains mandarin, sweet potato, carrots, ginger, grass-fed collagen protein, coconut cream, lemon juice, pumpkin seeds, coconut water, and dates. This tastes like a carrot cake with a little added “pep”. It’s definitely the sweetest of the bunch. Each smoothie is made from clean and simple ingredients. Many of those ingredients are also organic, which is definitely an added plus. Currently, you can receive SmoothieBox deliveries to all of the 48 contiguous United States. Unfortunately, that does mean they’re unable to ship to Alaska and Hawaii at this time. They cannot ship to Canada right now either. However, if you’re in any of those locations, it’s worth checking back to see if they’ve expanded their delivery range in the future. Once your order has been placed, SmoothieBox will submit it to their processing center, where everything will be packed and shipped out. You can expect your tasty smoothies to arrive at your doorstep anywhere from 2 days to 10 days after your order date. This is because deliveries are only made Wednesday through Saturday. Although they’re not able to accommodate specific delivery dates at this time, you will still receive an email notifying you when your order has shipped. You’ll also be provided with a tracking number so you can see exactly when it’ll arrive. All SmoothieBox orders are delivered via FedEx or OnTrac. Since a signature is not required for delivery, you don’t have to be home to accept the package. It’ll be left in a safe place outside of your home, so it’ll be there waiting for you when you arrive. Even though the delivery doesn’t require a signature, I recommend having it shipped to your work address (or wherever you’ll be during the day when it’s delivered). This ensures your box stays safe with you after being delivered. Because your items will need to stay cold during transit, the SmoothieBox team takes great care in packaging each order. They ship out each box with a specific amount of dry ice, which is calculated based on your location. As the dry ice inside evaporates, it mixes with the air inside the box and continues to keep your smoothies cold while in transit. Just make sure you don’t touch any of it and discard it as soon as your smoothies are put away because it can be a bit dangerous. If you open up your box and find that there’s no dry ice inside, don’t panic! That’s totally normal. Check the smoothies upon arrival. If they’re partly frozen, have ice crystals, or are refrigerator temperature cold, just place them in your freezer and they’ll be good to go. Our box came with completely evaporated dry ice. And while I was a little worried at first, the smoothie bags themselves were actually still cold. We immediately popped them in the freezer and they were good. Now you might be wondering how much freezer space you’re going to need for all your new goodies. Well, SmoothieBox recommends having 960 cubic inches of freezer storage to stash your smoothies. This is because you’ll receive 20 Super Smoothie pouches in each order. The Super Smoothie Base Pouch is approximately 8” long, 6” wide, and less than 1” tall. Be sure to make room before your order arrives! We didn’t realize how big the smoothie containers would be and actually didn’t have enough room in our freezer at first. Don’t make the same mistake we did and scramble to make room at the last second. These smoothies are delivered frozen and made with real, whole ingredients. 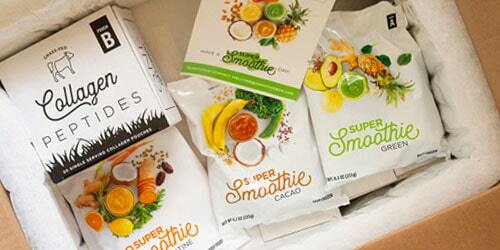 SmoothieBox chooses to use organic fruits, vegetables, and seeds to create their drinks. They never add sugars or sweeteners either, instead choosing to use dates as a natural sweetener. This is a big plus in my book. Too often when I’m looking for a healthy and quick snack it’s packed with unnecessary sugars. 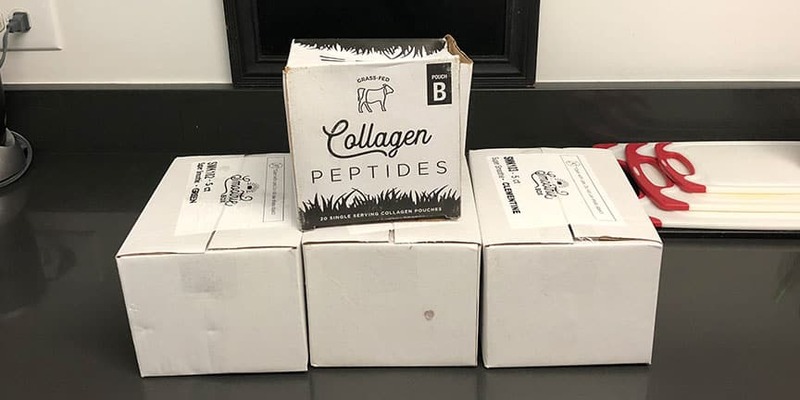 It’s also worth mentioning that the powdered collagen they add to each smoothie comes from grass-fed cattle. However, just to be clear, it is not certified organic. For those with specific food allergies, their smoothies never include: dairy, egg, gluten, or soy. However, they are processed on shared equipment that does handle wheat, tree nuts, dairy, egg, and soy products. You’ll want to keep that in mind if you’re sensitive to any of those ingredients. When you whip up a homemade smoothie, it can be a lot of work. Not only do you need to stock up on ingredients at the grocery store, but you also have to wash and prep the fruits and veggies you’ll be using. And what if one of the fruits or veggies you’re planning on using has spoiled? It can be time-consuming and sometimes frustrating, especially if you’re someone like me who is always on-the-go. That’s where SmoothieBox comes in to save the day. Their smoothies are incredibly easy to prepare. All you need is your preferred smoothie pouch, eight ounces of a liquid to add in, and your trusty blend. From there, dump everything into the blender and mix it up until it’s liquified. Making our smoothies only took about 30 seconds. If you’re not sure what kind of liquid base to add to your smoothies, there are a few options to consider. SmoothieBox suggests trying coconut milk, almond milk, or coconut water. We used water in our initial review and the smoothie consistency came out great. We’ve stocked up on almond milk to add to our future SmoothieBox smoothies. The Cacao Super Smoothie is without a doubt my personal favorite. 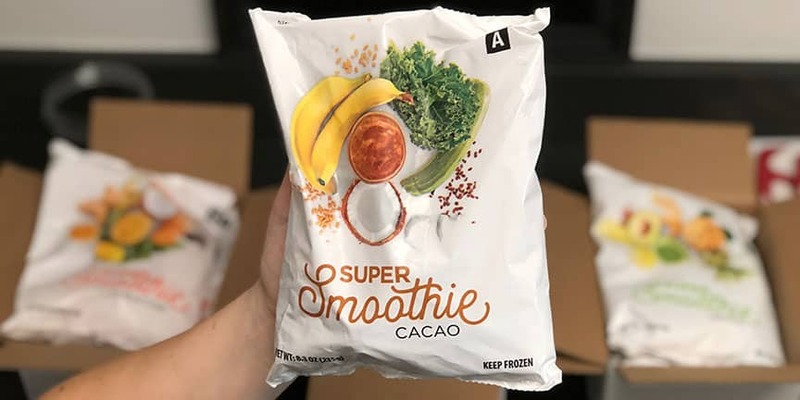 While it does have cacao/chocolate, the smoothie isn’t overloaded with it so it’s not a “sugar rush”. What’s more is that cacao, unlike the milk chocolate bars you’re likely to find in the supermarket checkout isle, actually have a wide variety of health benefits — from giving you an energy boost to helping out your skin. With 20+ grams of protein, I usually find myself reaching for this one after a workout. Of course, you can’t go wrong with the Green Super Smoothie either. Sometimes green smoothies can feel a little intimidating with crazy ingredients, but this one isn’t like that. With spinach, avocado, and pineapple, it delivers a fresh taste that’s sure to wake you up and leave you feeling ready to conquer the day. At first I didn’t love the added ginger — it gives the smoothie an added “kick”. However, after a few sips I found it actually gives it a nice unique flavor. It won’t be for everyone though! So, what is all of this going to cost? To get 20 smoothies with SmoothieBox, you’re looking to pay $119. That comes out to $5.95 per smoothie. Considering that most smoothie bars charge upwards of $7 or $8 per smoothie (with added sugars) this is a pretty good deal. And when you consider how much high-quality, fresh ingredients will cost you at the grocery store and how much you’re throwing away because you weren’t able to finish it before it went bad, this could be a great investment for you. One major plus is that you’ll receive free shipping with your order. Because no one likes to pay shipping, right? And remember that you’re in control when it comes to the frequency of your orders. You can choose monthly deliveries or get new smoothies every other month. Are you a smoothie lover who hates the hassle of having to make them at home? If so, you’ll definitely want to check out SmoothieBox. It’s one of the best frozen smoothie delivery services we’ve reviewed. It’s a great option for anyone who wants to make delicious, healthy smoothies at home without taking a lot of time or making a huge mess. Since everything is pre-portioned, SmoothieBox makes it easy for you to get your smoothie fix on a daily basis. Plus, you can feel good about drinking them because you know they’re made with real, whole ingredients, many of which are organic. I really love that they added collagen to their smoothies. Not only because of its health benefits but also because it’s a great protein boost. Though some may find lack of flavors a disadvantage, you can always hold out hope they’ll add some new ones in the future. But hey, if you like the ones they have, it’s still a good bit of variety that you can add to your daily routine. Have you tried SmoothieBox before? Have a question about it? Leave your review or comment below! I was so excited to try these smoothies, as I have food allergies and Greenblender took a hiatus. Although Smoothiebox advertising guarantees satisfaction, the actual taste of the smoothies are disgusting. I also threw the box out. It is false advertising–please don’t be fooled. I found their website interface to be confusing, in that, it was not clear that they would be sending another box out. It is a subscription (it is written in the fine print) and I didn’t see this at first (which I take accountability for). Most online food and smoothie companies send reminder emails notifying the customer that they have a choice to skip or cancel that week/month. Smoothiebox does not communicate clearly with the customer. When I missed the cut off by hours to cancel, they would not honor my request, and still charged me and sent another box of smoothies, even though I asked them not to and the box had not yet been shipped. They could have easily canceled the order, and given me a partial refund. I asked that they donate the smoothies to a charity–they continued to send them to me. I explained it was more of a hassle, and they refused to refund me, even partially. Their idea of resolution was sending me recipes to improve the taste of the smoothies, which I pointed out only validated that the taste of their smoothies were sub-par. 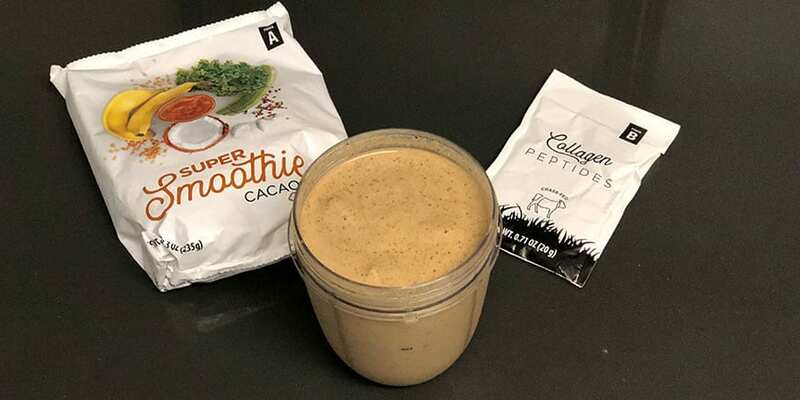 I am not one to spend time writing negative reviews, however, I write this now, to prevent anyone from trying this product, and then expecting that Smoothiebox will honor their product and provide a refund. I would not want another person to make the same mistake that I did. I’m so sorry to hear that, Kristina! Did you get this resolved? I chose smoothie box because the ingredients are not processed and no sugar is added and the price was better than others. I got 20 smoothies for $104 (I had a 15$ discount). Still pricey in my opinion but I guess you’re paying for convenience. I just got my first shipment this week. My husband and I tried the green and clementine smoothies yesterday. I was pretty disappointed. The green smoothie was terrible. The directions say to add 7 ounces of liquid but I had to add way more (I have a Blendtec blender so it’s pretty powerful and 7 ounces was not nearly enough liquid). The taste was awful – it tasted like a grass smoothie. My husband and I split it and I could not finish mine. Next, was the clementine. This was better, not great and not enjoyable but tolerable. It blended nicely with 7 ounces of almond milk. The ginger taste can be a bit overwhelming but, again, it was tolerable. Today I tried the cacao and was pleasantly surprised. It was actually enjoyable. It has a nice hint of banana and of course the chocolate flavor. I’m on the fence as to whether or not I will keep up my subscription. Thanks for your comment, Sue!